With technology evolving at break-neck speed, a large number of companies are resorting to social media for the purpose of marketing their goods and services. Besides this, a lot of people even use social media calendar templates for posting events or sharing content. To make it easy, we have a range of ready-to-use social media calendar templates. These templates are absolutely free of cost and available in a variety of formats. Here’s the list of templates: You can also see Event Calendar Templates. 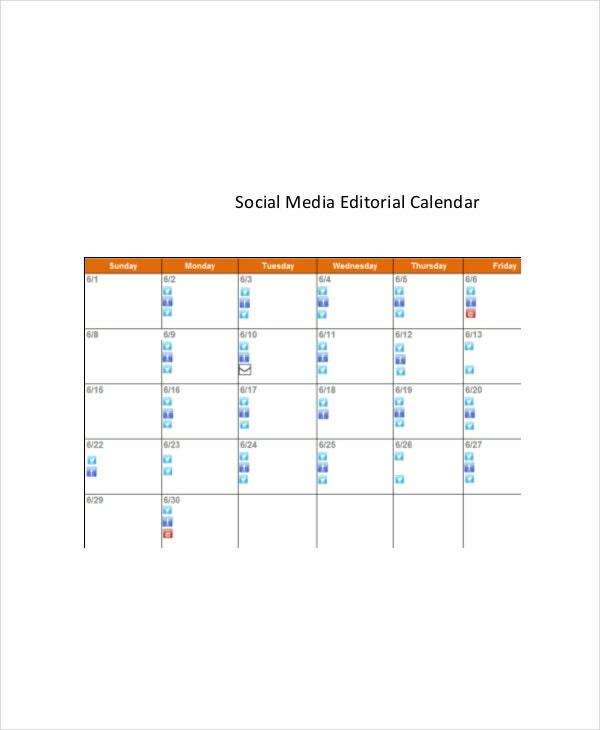 The social media Calendar Templates excel sheet is a weekly marketing page. 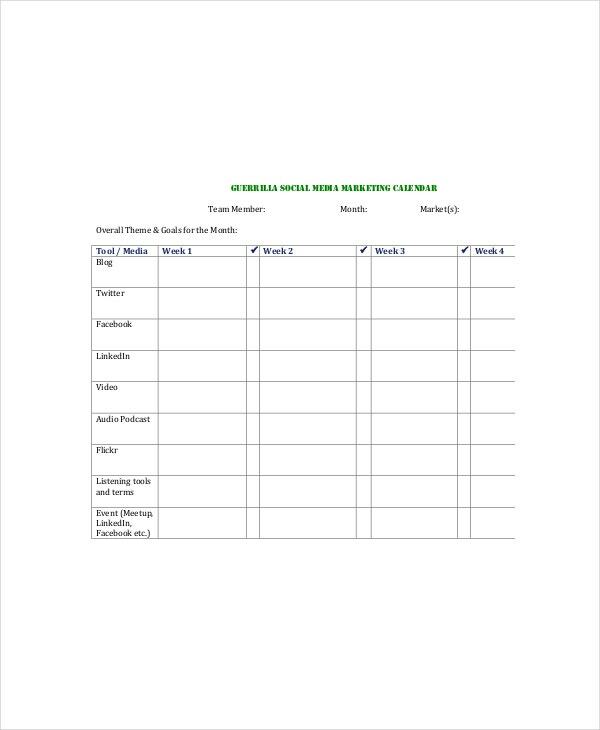 It has a column for the tool/media and four columns for the four weeks of the month. The posting template is the perfect social media planning calendar. It has columns for the date, topics, post, character counts, hashtags and other information. This PDF file is easy to download and use. The free social media content calendar has individual columns for title, author, deadline, publishing time, topic, images and publishing channels. 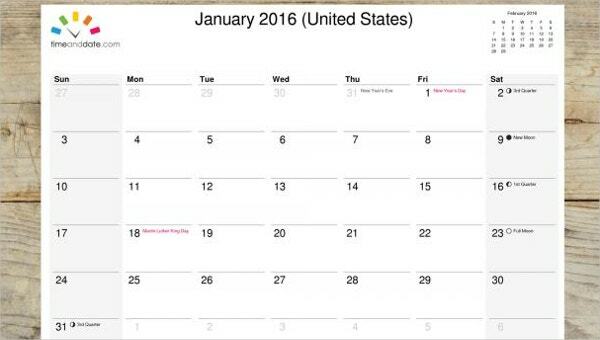 This social media calendar 2016 is in an Excel format. 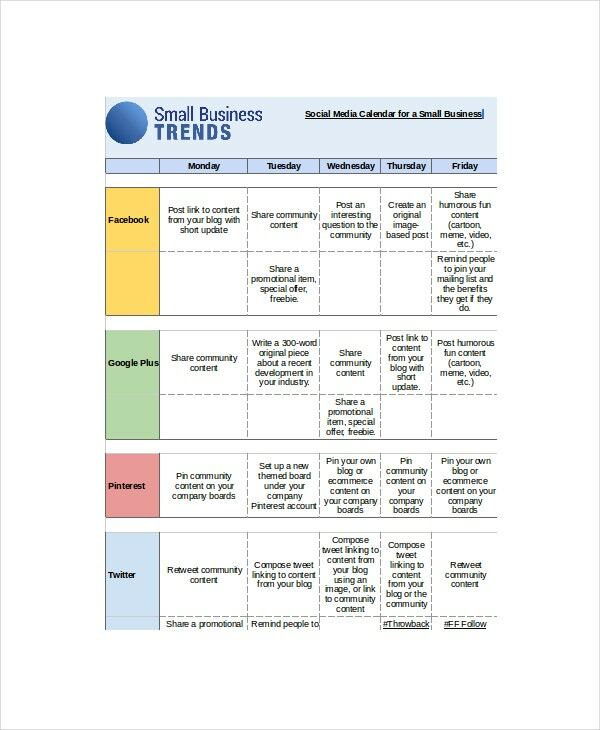 The free social media calendar template for small business is a weekly Excel sheet with columns for each day of the week as well as a column for the tool/media. You can also see Pocket Calendar Templates. 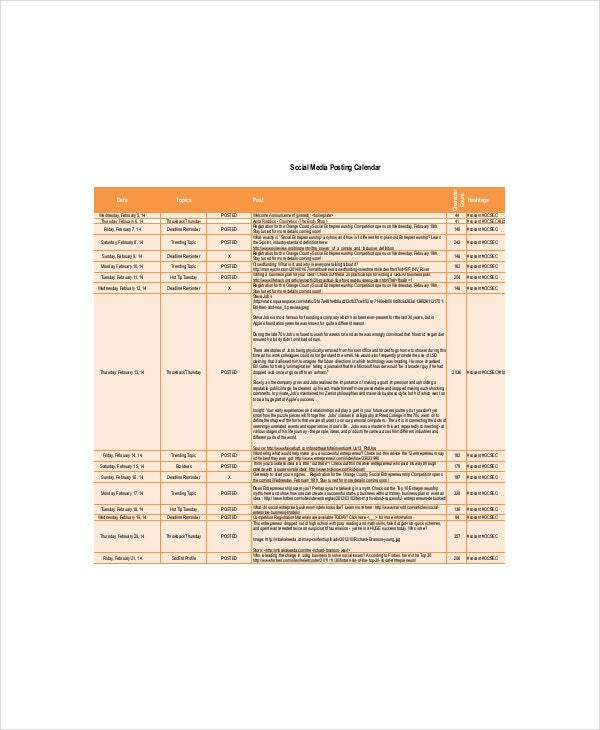 The content marketing editorial calendar template is another weekly calendar with columns for individual day of the week. It is easily downloadable and is available in Excel format. > How To Create A Social Media Calendar? Thanks to these social media calendars, the task of creating one has been simplified. 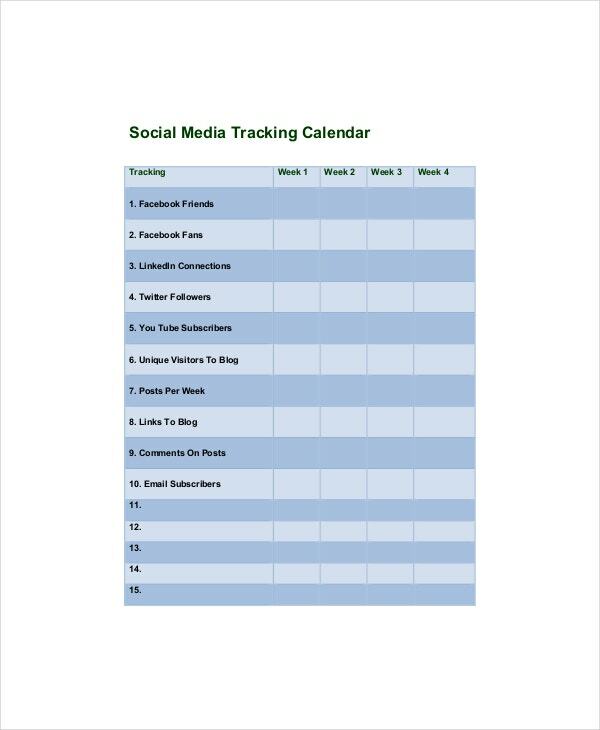 Now, you no longer need to draw up a social media calendar from scratch. Just select the template of your choice from the above-mentioned list and download it. These templates are easily editable. You can also see Desk Calendar Templates. The user can edit the content in each individual column as per his or her specific requirements. 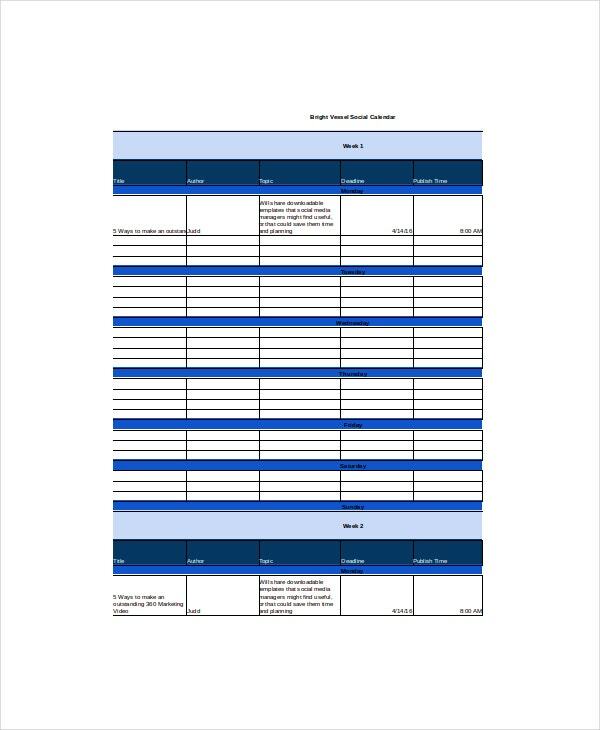 Once the templates are edited, they can be quickly emailed or printed. Deciding what content resonates, how often you need to post content, creating or sourcing content to share is solely up to the user. In today’s day and age, any business that wishes to be successful requires social media presence. Social media presence plays a vital role in expanding your business. Creating a social media calendar works wonders in helping save time and managing your resources in an efficient way. You can also see Birthday Calendar Templates. Having a proper social media calendar helps you ensure that you don’t end up overloading one social media website and avoiding and ignoring the others. Additionally, it also guarantees that you won’t end up missing important dates such as national holidays or important dates. If you’re planning on creating a social media calendar, there are certain things you need to keep in mind to ensure that the calendar you make is effective. First and foremost, you need to figure out when and how often to interact with your audience. You can also see Training Calendar Templates. You need to constantly provide new and improved information and content to your readers on a timely basis. You also need to ensure that the content you provide is relevant to your business or your brand. Irrelevant content will only cause a disinterest in your audience and be detrimental to your company’s growth and expansion. 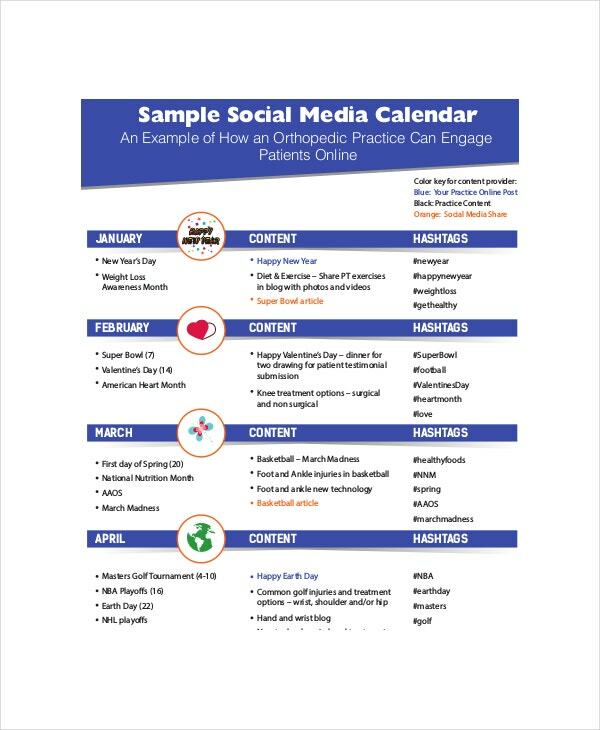 Social media calendars are extremely useful and are an absolute necessity for every organization. They are one of the most popular ways to get the ball rolling and attracting a larger audience and bigger number of customers and clients. So if you’re looking to move forward and take your brand or business to new levels, it is crucial to have a social media calendar.